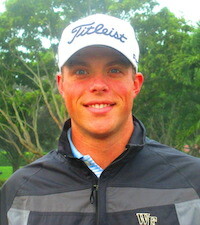 PALM CITY, Fla. – Charlie Harrison of Atlanta, GA, birdied the first playoff hole Tuesday to claim his third victory on the Minor League Golf Tour. Coincidentally, all three of his wins have been at the same venue, the Osprey Creek course at Martin Downs Country Club. After a tie at six under par 65 with Blake Morris of Waterbury, CT, Harrison sank an 18-foot putt on the par-4 first hole for the win. Moments later, Morris missed his birdie opportunity from 13 feet as the ball slid past the right edge of the hole. In regulation, Harrison made seven birdies and a bogey, Morris three birdies on each nine of a mistake-free round. Previously, Harrison won at Martin Downs with 65 on March 24, 2016, and with 66 the past March 16. He earned $700 from the $2,745 purse and an additional $194.50 from the optional bonus pool. Morris, runner-up among 22 starters, collected $450 and $194.50, respectively. The MLGT next plays Wednesday at Seagate CC in Delray Beach then a 2-day event on the Champ course at PGA National next Monday and Tuesday, host of the PGA Tour's Honda Classic.